What Does Your Conference Bag Say About You? Your bag gives away more about you than you might think. Attending the O’Reilly Tools of Change for Publishing conference last week, I was reminded of my first summertime Eurail trip through Europe when I discovered that you could almost always identify the country of origin of fellow travelers by the make of their backpack: Italians inevitably carried Invicta, Brits were laden with Karrimor, Germans toted Deuter, Swedes had their trusty Fjällräven packs, and the Americans usually wielded something from Jansport or L.L. Bean. Having this information was useful insofar as it helped you scope out who you might have a chance at chatting up and maybe scoring an early morning excursion to that out of the way attraction once the train arrived in the morning. At TOC, the bags people carried didn’t quite indicate their country of origin, as much as it did their likely status or place in the publishing pecking order. Loosely speaking, true techies — most likely hailing from San Francisco — were hauling Rickshaw messengers (as opposed to Timbuk2 bags, the 2010-2011 bag of choice); New Yorkers favored Manhattan Portage bags (for the blokes) and big pricey handbags (for the ladies), and almost everyone had a Cocoon Grid-it bag — a giveaway from conference sponsor Copia (which shares an owner with the Coccon brand), bouncing off their hip. You could even spot a few folks who managed to source a coveted Porter Bag from Japan. (That’s commitment to quality). So what does your bag conference bag say about you? And what are you partial to? Are you a fan of Defy? Red Oxx? 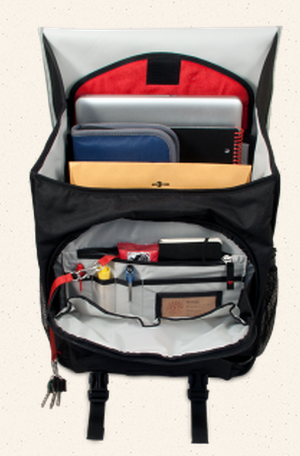 Or maybe Tom Bihn? (I am a fan of all three brands and highly recommend them). Or perhaps you have another strategy? An iPad carried in a ScottEVest?